What is the Black Moon/Lilith? In Jewish mythology Lilith was the first wife of Adam. Because Adam treated her as a lesser person from the beginning, Lilith ultimately decided to flee as far as possible from him and the earth. That is why we use the term “Black Moon” or “Lilith” for the point of where the moon is the furthest removed from the earth. The Black Moon isn’t a planet but a hypothetical astronomical point, which arises due to the Moon’s path around the ecliptic. It’s an empty area, a void created, an empty focus. In your birth chart the Black Moon is the symbol of the dark part of your personality. This is the darkest and most hidden part of your psyche. It tells you how you respond to conflict situations, when there’s nobody to help you out. The Dark Moon will bring you in situations where you don’t want to be confronted with and with people you’d like to avoid. Under the influence of the Black Moon, you sometimes run into (temporarily) difficulties by exposing impulsive behaviour. Above all the Black Moon confronts us with ourselves. 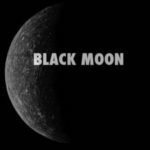 The big difference with the influence of the planets and astrological points however, is the fact that the Black Moon seldomly is recognized and that its lessons offered to you are very difficult to learn. Certain situations keep coming back on your path until you become aware of the lesson to be learned. The Black or Dark Moon classically means imbalance, extreme behaviour, a paradox. Personally I wouldn’t just call it a blockade, but rather a chance to grow; certainly nothing insurmountable. Superficially considered, the Black Moon only seems to bring misery. But these negative things can sometimes bring important turning points to your life and development and ultimately trigger changes in a positive way. Lilith is a key to your birth chart that reveals all the characteristics you would prefer to hide from others as well as yourself. But the dark side of your personality is particularly powerful. It is a creative point. When you cast light on your shadow side, and you are able to transform the initially negative properties of the Dark Moon, you’ve learned a major lesson. Our birth chart can help us to discover where our own Black Moon – paradox lies. The sign where the Lilith is located in the birth chart, reveals in which way we behave ambiguous or paradoxically and in what manner we deal with loss, a deep desire or injustice. The House where the Lilith is located, indicates the field in which to expect difficulties. To find out the zodiac sign of your Black Moon (Dark Moon/Lilith), consult our tables. To really know Lilith is to feel her within yourself. You will read many different Lilith stories in different books and web sites, but the best understanding of her will come from deep within yourself. She is the embodiment of the Divine Feminine in your soul. She has come to be expressed consciously and fearlessly. These keywords may resonate with your Lilith. Use the words to feel deeper into your own personal expression of her. She is Divine creativity at its highest and She will open you to what is essential in you. These words are meant to inspire your Lilith towards positive expression. Lilith in Aries can consciously channel Lilith energy through movement of the body. Feel her in your movement. Lilith in Taurus can find energy through being in nature, whether forest, beach, dessert, or field. Feel the earth beneath your feet, moving up through you. Lilith in Gemini can open by communicating the soul through truthful conversation, writing, or telepathy. Lilith in Leo can expand by allowing the heart to be fully present in every action and make their own creative choices. Lilith in Virgo can flow by honoring nature’s cycles and the bodies signals. Lilith in Libra can be free by balancing heart and mind and bringing them to union. Lilith in Scorpio can surrender by consciously using the true power of love as their instrument. Lilith in Sagittarius can open to truth by opening to the intuitive knowledge of the universe. Lilith in Capricorn can open to the personal calling by heeding the inner calling of authenticity. Lilith in Aquarius can be free by accepting all parts and appreciating the rainbow of energies. Lilith in Pisces can find oneness in the self by uniting creativity with dreams and making them physical.